I am in Ecuador at the moment, where I arrived with my family 6 days ago for a three months trip in Latin America. 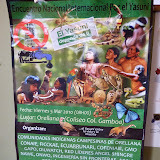 I have just came back from a conference on the Yasuni area of the Amazon, where in the last 30 years, petroleum enclosures have been threatening the common land of the Waorani and some of the last indigenous peoples still living in isolation in the Amazon. We learn that there is no clean oil exploration, that the amount of toxic by-product — even in the case of no spillage — is enormous and very difficult to handle, with toxic consequences for sources of fresh water and all forms of life depending on it. Around the wells used to search for oil, the percentage of oil in the land was so high to be 20 or 30 thousands times above the maximum level for safe agricultural production. The aim of the encuentro was to try to counter the ambiguity of the Ecuador president Correa who in 2007 has offered a plan that Ecuador will not allow extraction of the ITT oil fields in Yasuní, if the “world community” can create a compensation trust to leave the oil permanently in the ground and fund Ecuador’s “sustainable development” into the future. I leave aside here the fact that in the recent versions of the proposal this “compensation trust” was substituted with a marketisation of the Yasuni in terms of carbon credit bonds, a mechanism highly criticizable not only because carbon credit markets have been found ineffective to meet the need of carbon reduction and because they tie the resources destined for social and ecological ends to speculation, but also because they threaten the autonomy of the indigenous people over their territory, since carbon bonds requires the local indigenous to act in the interest of the “monetary value” of the Yasuni carbon bond in competition to all carbon bonds issued around the world. However, a part from the carbon market replacing the trust, Correa seems to want to master an incredible juggling exercise. On one hand, declared that no further oil exploration will be undertaken in the Yasuni area, while on the other hand and at the same time, he is signing permits for further exploration. I asked people around, and the reasons given to me for this contradiction are various, ranging from the fact that he is a very whimsical man, passing through the effect of the oil lobby, and arriving to the fact that the plan was never his in the first place, but of economist Alberto Acosta, who originally proposed the plan and since then he left the government. (Acosta was at the encuentro, and a very critical voice, calling for a moratoria of all oil exploration, invoking the new constitution, claiming the movement project as a life project not only for the indigenous or the Ecuador people, but for the entire planet, since Amazonia is the source of water for the rest of Ecuador and Yasuni has the greatest biodiversity in the world). But maybe this juggling is really the manifestation of the fact that to coopt the commons one needs to leave the options open, so as to navigate the contradictions and jump in the moment when opportunity arises. The project of commons-cooptation seems to me quite evident walking around the city of the encuentro — Orellana — and the nearby city of Coca — a dusty oil town, the gateway of the Yasuni park. They are both covered in posters that invite citizens to think of their city, their country and their resources as theirs. Posters like “your resources, we handle them well”, or “the country is yours, you have the power” seem to show that wanting to instil a sense of “common ownership” is clearly important from the state/oil companies propaganda’s side. A different sense of “common ownership” instead came up in the Yasuni encuentro, where I have been hearing several indigenous voices speaking, all demanding for an uncompromising end of oil exploration and an end of oil activities in the Yasuni. One after another these voices gave different illustrations of the reasons for this, but all repeated different versions of the same tune: Pachamama. Pachamama is the deity of Andean origin and refers to “mother earth”, not just as geological earth or nature but also as a set of relations, a deity of reproduction, a protective rather than creative deity or perhaps better, a deity for which human creation is just a moment of a reproduction cycle. In this sense, the discourse is quite distinct from Western environmentalism, that — a part from the gaya hypothesis — sees earth as simply the context of human activity. It seems to me that paradoxically, the insistence on Pachamana, as the sacred mother earth from which we depend on, is, quite amazingly, a materialist approach to nature. The idea that “mother earth” is a precondition of our existence echoes Marx’s notion that earth is the mother of value, that is the precondition for all human activity, an insight often left out in the compendia of Marxist thought. The deity of Pachamama is a deity of protection, but as all religions, is a reflection of a human cosmological vision that grounds action. It is man and women who must protect earth, if earth must deliver the means for human survival. Otherwise, “la Pachamama tiene hambre frecuente y si no se la nutre con las ofrendas o si casualmente se la ofende, ella provoca enfermedades.” (wikipedia) The story of climate change seems to fit quite well this narrative. In the Encuentro on the Yasuni, Pachamama is evoked endlessly in all different ways, until one realises there is little mysticism in Pachamama, or at least, the rational kernel of mysticism is grounded on solid material reality, the reality of property relations, of clashing idea of “common ownership”. The indignation of the people whose land is threatened with petrol leaks and toxic waste find in Pochamama a value discourse that clashes with the value discourse of the oil companies and the state, but at the same time enable them to compete with this discourse in terms of seeking alliances and building up the scale of the movement. This discourse is actually extended, as around the Yasumi there is a discursive recomposition that exceeds the struggle and the preservation of the indigenous communities, and begin to involve “planetary Pachamama”. Yasuni after all is a planetary lung of crucial importance for global climate and biodiversity, as all the rest of the Amazon rain forest. The claim over the Yasuni is thus in the first instance a claim over use and access: the people who recognise the importance of the Yasuni for their preservation must have use access to the forest. Autonomous control of the territory by the indigenous community is crucial for the maintenance of the use appropriate use. The lie is of course a lie to the extend we see it from outside, from a different value system and value practices, in the case of the speaker, from the value system captured in Pachamama. In our daily life within capital’s loops, the lie of having to run the race to acquire money to get by is a very potent reality, one that blur our vision and hide our ultimate dependence to the eco-system. Thus, this third conflictual element is the most difficult to deal with and recognise in a politically effective way, because in the course of the reproduction of daily life as “homo economicus”, our true “dependence to Pachamama” is structured in such a way that we see only our dependence on money and, therefore, on the social mechanisms that reproduce and accumulate money. How we do disentangle from this is one of the most important question we face. And obviously is not only a question of “false consciousness”, because the dependence on money is real .. Thus, we have here a clash between two claims of ownership and the politics of “alliances” around these two claims. One, by the state and oil companies as “representative” of the ecuadorians, for which they administrate their oil resources while preserving the forest (sic — an impossibility). On the other by the Waorani as “representative” not only of ecuadorian, but of humanity as a whole, since the Waorani commoning on the Yasuni is the only way to sustain the Yasuni as planetary commons. To to put in another way we have the following points: 1) earth provides food, clothing and all we need — it cannot come from anywhere else! Hence to the community of the Yasuni, the preservation of the forest is of crucial importance. 2) therefore the indigenous claim common *ownership* to the part of earth that give them sustenance, the yasuni - to the jungle, the river, the bio-physical relations therein. 3) a claim of common ownership that almost naturally turns into a claim of autonomy in terms of the administration of the territory, since the *preservation* of the Waorani is one with the preservation of the Yasuni, and 4) Pachamama and homo economicus reveal two distinct and clashing valuing and measuring rationalities upon which notion of ownership (use access + control) are built. Yet, Pachamama is not lack of recognition of pay offs. The indigenous commons ownership also translate in pay offs to the Ecuadorian people (preservation of water sources for the entire country) and the world (through preservation of Amazon sink), thus the Yasuni is also a commons to them, at a different scale, and with different modalities of use-access and control, yet a common nevertheless. Hence, the struggle here also provides a basic general framework within which to devise schemes of compensation and reparation through which not only the Yasuni stay without oil and trash, but also without poverty. A corrupt party official is killed. the young killer becomes people’s hero. . . . set in the context of the recent history of rapid urbanisation and land enclosures. As one man says at the end about 60th anniversary of the People Republic of China the other day: what was that, a celebration or a funeral? I report below an updated press statement on the attack on the Kennedy Road Development Committee (KRDC), an informal settlement in Durban, KwaZulu Natal, South Africa. The settlement has been for many years at the center of people commoning on housing, electricity and water. The situation in South Africa seems to be at a crucial point and resistance to ANC politics, which is now meeting a wall of violence. This press statement has been updated. Please use this version from now on. We will update further as we get further information. Last night at abo ut 11:30 a group of about 40 men heavily armed with guns, bush knives and even a sword attacked the KRDC near the Abahlali baseMjondolo office in the Kennedy Road settlement. The movement was holding an all night camp for the Youth League but the camp was not attacked but the people at the camp were intimidated and threatened. The men who attacked were shouting: ‘The AmaMpondo are taking over Kennedy. Kennedy is for the AmaZulu.” Some people were killed. We can’t yet say exactly how many. Some are saying that three people are dead. Some are saying that five people are dead. Many people are also very seriously injured. The attackers broke everything that they could including the windows in the hall. They destroyed 15 houses before launching their attack. They were knocking on each door shouting ‘All the amaZulu must come out’ and then destroying the shacks. As far as we know two of the attackers were killed when people managed to take their bush knives off them. This was self defense. I was recently drawn back to some of my older writing on the Tobin Tax by a companera’s request to comment on it. So, I thought that since the Tobin Tax is and will be on the agenda of some sections of the movements, it has been raised in the Beijing declaration by Focus on Global South and TNI, and it has already attracted some critical comments in various lists, it would be important for us to give it a slightly more critical analytical consideration. In the following notes I will freely take from my old article “Capital Movements, Tobin Tax, and Permanent Fire Prevention: a Critical Note.” In Journal of Post Keynesian Economics, Vol. 22, No. 2, Winter 1999-2000. First, for those who need an intro, the Tobin Tax is a tax levied on foreign exchange transactions and takes its name from James Tobin, who proposed it in 1974 in the midst of the then crisis back then. An element of that crisis was the rise of short term capital movements, which nevertheless were a fraction of what we have today. There are three main interrelated criticism of the Tobin Tax. The first one comes from Paul Davidson, a post-keynesian economist, who argues that “the imposition of a Tobin tax per se will not significantly stifle even very short-run speculation if there is any whiff of a weak currency in the market. In fact, any Tobin tax significantly less than 100% of the expected capital gain (on a round trip) is unlikely to stop the sloshing around of hot money. (Davidson 1997: 678)” Thus, taking for example the case of the fall of the Mexican peso during the crisis of 1994-95, in which the peso fell by about 60%, a Tobin tax of about 23% would have been required to stop speculative run on the peso. In our terms, therefore, the first argument against the Tobin Tax is that it is not a solution to capital movement and their disciplinary role of enforcing crises following profitability expectations. The second argument is this: if we want the tobin tax because it transfers money from capital to labour, then it is legitimate to ask why the Tobin Tax and no other form of progressive taxation or wealth redistribution and reformulation of property right? This question is even more legitimate, assuming the validity of the first argument. Third, and consequently, there is what Werner mentioned, that is the Tobin Tax “comprise well thought out ideas as to how to secure existing social relations”, i.e. capitalist relations. It is a mild form of capital control, that does nor prevent crises, it modest revenue raising powers gives the impression of addressing social justice, but it will be instrument for casting a new capitalist deal. With respect to this, for us the question will be to try to assess how — in today’s given context of crisis in its specificity — the tobin tax could in fact be used to secure existing social relations, as a part of a new deal. But in general, let us hope that our marches and demos in the next months and years will see less of those awful banners with the “%” sign: I could never had thought that such a symbol of capitalist compound interest rationality could also become the symbol of part of a social movement. Here are some more links about the current global food crisis. We need to keep watching the World Bank on the matter. On the 29th of April World Bank Group President Robert B. Zoellick announced that “a New Deal must embrace a short, medium and long-term response: support for safety nets such as school feeding, food for work, and conditional cash transfer programs; increased agricultural production; a better understanding of the impact of biofuels and action on the trade front to reduce distorting subsidies, and trade barriers.” In short, conditional feeding. He also called for Sovereign Wealth Funds to use a small percentage of their assets to provide the cash for this new deal. As in the late 1970s the petrodollar were used to fund third world debt to “help their development”, so now, the accumulated surplus which followed the last round of global accumulation can serve the next round of global restructuring. Here are also three links that highlight speculation as the main reason for the recent climb in food prices. “Conventional explanations for the food crisis range from climate change to dietary change in China, from global overpopulation to the switch of agricultural production to biofuels. These long-term factors are important but they are not the real reasons why food prices have doubled or why India is rationing rice or why British farmers are killing pigs for which they can’t afford feedstocks. It’s the credit crisis. What does need to be explored is the link between the alternating of speculation waves (the latest of which is on food prices) and different phases of global restructuring. Also, I am curious, how many pension funds hold commodities futures in their assets? Overview: Stefan Steinberg, “Financial speculators reap profits from global hunger”, Global Research, Centre for Research on Globalisation, Montreal, 24 April 2008.
. . . food riots . . .energy. . .climate change. . . The extract below says it all . . .the video at the Democracy Now! site explains it: among other things, the countries that have liberalised most are those in which global food price hikes are hurting most . . .
AMY GOODMAN: For our last segment, we look at the dramatic rise in global food prices, adding a new level of danger to the crisis of world hunger. In Africa, food riots have swept across the continent, with recent protests in Burkina Faso, Cameroon, Ivory Coast, Mauritania, Senegal. In most of West Africa, the price of food has risen by 50 percent—in Sierra Leone, 300 percent. Last week, African finance ministers warned the rise in international food prices “poses significant threats to Africa’s growth, peace and security.” Other protests have been held this past week in countries like Cambodia, Indonesia, Egypt. In Haiti, at least five people have died in riots over 50 percent price hikes for rice, beans and fruit since last year. The demonstrations continued Monday outside the national palace in Port-au-Prince. HAITIAN DEMONSTRATOR: We are protesting voluntarily. It is not for money. The parliament is responsible for all of this. All we ask for is for the government to cut down on prices of food. This short film surveys the tactics used by the city administration of New Orleans, to try to get “affordable” housing tenants out of their houses, so as to “regenerate” them for money making. It also shows some of the struggles of the tenants to stay in. They have other types of “regeneration” in mind. A clear case of value struggles.